Through the eyes of fashion. I completely missed the memo on Ports 1961. Each seat had a bag with a ball of yarn and knitting needles, so naturally I assumed that the show would be filled with chunky knits or woven sweaters but oh how I was off. Okay so there was a hint of crocheted pieces and floating yarn appliques. 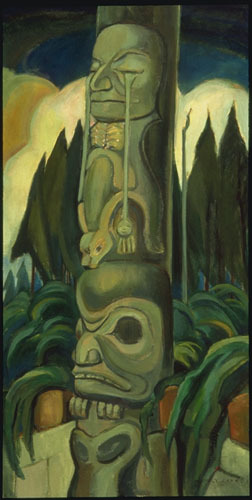 Apparently inspired by a Canadian painter, Emily Carr and the tree-lined shores of the Pacific Northwest. The country rock group, Cowboy Junkies played at the front of the stage as the models topped with Karen Henriksen Millinery hats, lethargically moved down the runway. I felt chills when Cali sang Blue Moon and Sweet Jane but the whole time I couldn’t help but think… am I in the middle of Disney’s broadway hit The Lion King? Will you be my muse? “Big Eyes” at the house of Charles Nolan. Make my Couture Couture royally JUICY. A tribute to Gossip Girl’s Taylor Momsen. Influence can come in the moment.